His „moon girl“, pasted across numerous german capitals, is already known to the attentive street art observer. It is an unobtrusive and subtle paste up, which harmoniously adapts to its environment and yet stands out – in a quiet manner. The street artist seiLeise, which means “be silent” aka Tim Ossege started his graffiti career in his early teens. 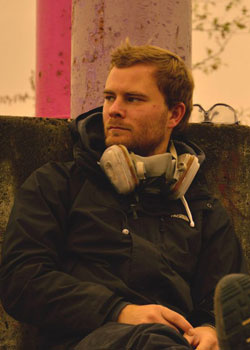 As skilled graphic designer he soon turned his back on the commercial advertising industry and started creating reverse graffiti in 2010 in his hometown Cologne. This sensitive concept, which is in perfect accordance with its urban surrounding, is also reflected in his stencil works. The characters in his visual world are staged unaccompanied and appear almost lost and lonely. The reduction of the image content to the essential enables personal identification – we are together lonely. Unobtrusively and intense enter his artworks enter into dialogue with the observer. SeiLeise lives and works in Cologne.